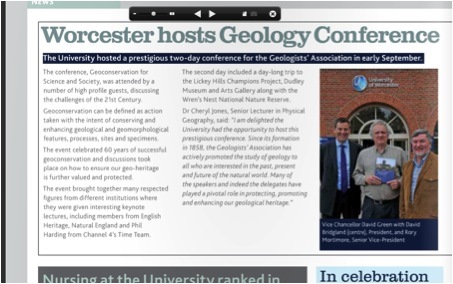 GT members made major contributions to this Geologists’ Association conference in September 2011. The two-day conference was held at the University of Worcester and attracted both a large audience and a range of high-profile speakers, including leading figures from English Heritage, Natural England, the National Trust, Heritage Lottery Fund, and Phil Harding from Channel 4’s Time Team. Lectures on best practice and the successes and state of geoconservation today were followed by a discussion on how to deal with the challenges of the future – economic uncertainty, government policy and the need to enthuse and engage the general public in their geological heritage. With so many concerned practitioners in the audience, the discussion session was far too short and barely started to touch on the solutions to the problems faced. The conference did however make a start by bringing together so many interested parties and the GA has made available the proceedings of the conference on its website, including the excellent presentation given by GT chairman Martin Whiteley. This described the successes and challenges of county based geoconservation work and was prepared in conjunction with Mike Browne, chairman of GeoConservation UK. During lunch and breaks, delegates attended poster session, covering a wide range of geoconservation topics. Posters were presented by The Geology Trusts and two of its member groups, Warwickshire Geological Conservation Group and Herefordshire and Worcestershire Earth Heritage Trust. The second day of the conference was a field trip and GT members again made an important contribution. The first stop was at the Lickey Hill Champions project site led by Champions project manager Eve Miles from Herefordshire and Worcestershire Earth Trust, followed by visits to the innovative Dudley Museum and Art Galley and Wren’s Nest National Nature Reserve.